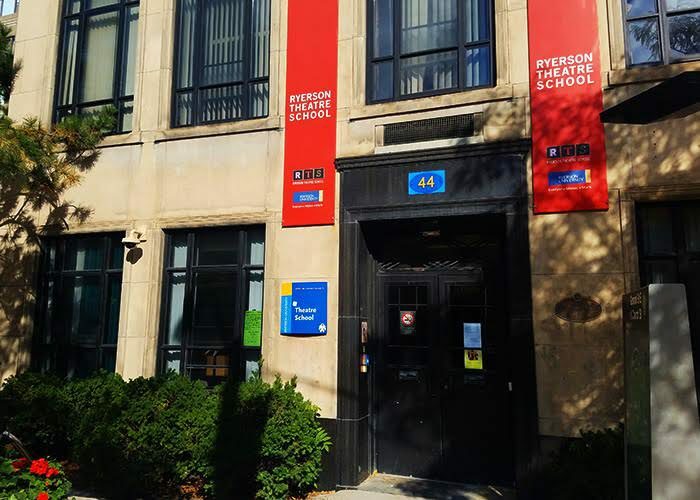 A student’s shoulders dropped slightly when he entered room 239 in Ryerson’s Kerr Hall South. Scanning from left to right over the frame of his glasses, he looked for a proper seat, but his search came up short. His midterm was about to begin. He resorted to a lone seat in the path of the doorway. It was clearly brought in separately and was far too small for a comfortable fit, but at least it had a desk attachment. It wasn’t long before the room’s large door swung open again, narrowly missing the gentleman who had squeezed into that desk, which somewhat resembled a booster seat a toddler might sit in during a haircut. Another student walked in and began the same assessment as the person before. With no designated seating left in the room, he got creative, grabbing two regular chairs from under the projector screen. He sat on one and hunched his body over the curved chair opposite to him, which doubled as his desk. With every answer he filled on his Scantron, he maneuvered the paper into new positions to ensure his pencil didn’t poke through the other side. The problem they had with finding seats is indicative of one of Ryerson’s worst kept secrets: the campus has major spacing issues. It’s a problem that everyone from students to professors to Ryerson president Mohamed Lachemi is, more or less, aware of. 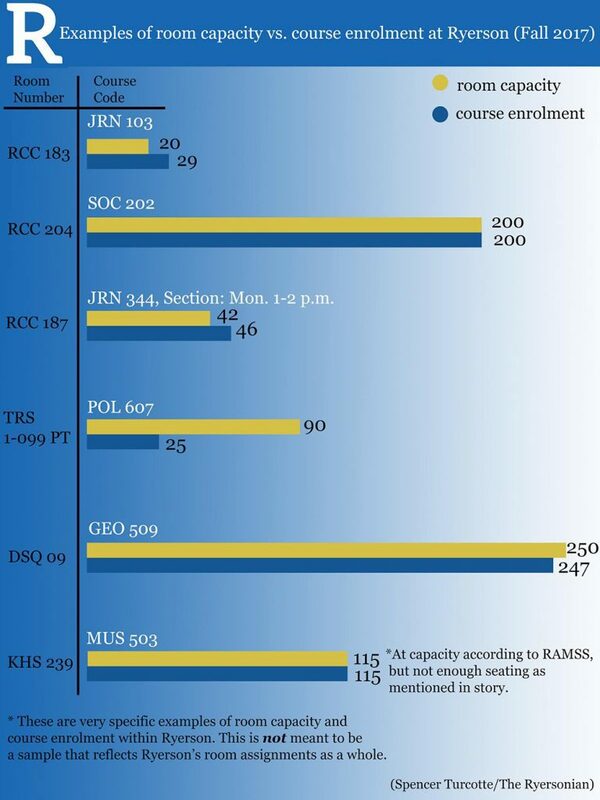 Ryerson’s skyrocketing enrolment numbers have also played their part. In 2015, during his final year, former president Sheldon Levy told the Ryersonian that he envisioned a future where the school would have an enrolment of 100,000 students within a 25-year time frame. It was a towering quest, but one Levy deemed achievable. From the 2010-11 school year until 2016-17 (2017-18 numbers have not yet been calculated), Levy’s goal has seemed at least somewhat attainable. During that period, Ryerson’s overall enrolment has vaulted from 26,663 students to 35,166, an increase of nearly 9,000 students. But during that time the school’s space utilization rate (SUR), which measures classroom size versus actual classroom capacity, has increased. 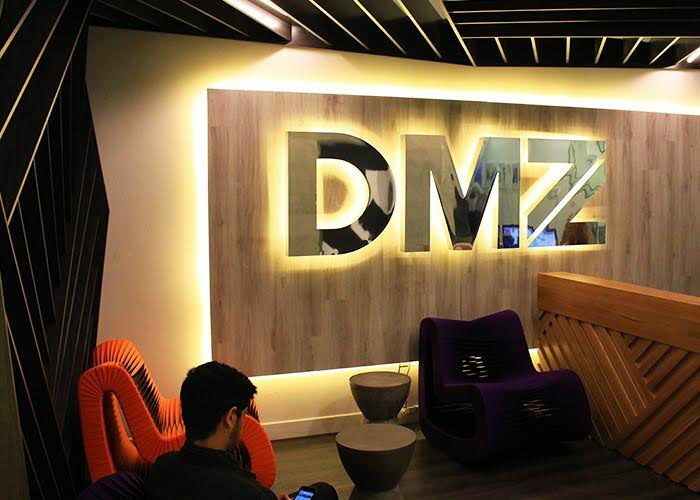 Despite having completed and introduced Ryerson’s Digital Media Zone (DMZ), the Mattamy Athletic Centre (which offers no lecture halls or classroom spaces), the Image Arts Centre and the Student Learning Centre, the school’s 2016-17 SUR rested at 92 per cent. For comparison’s sake, it was only 80 per cent in 2015. 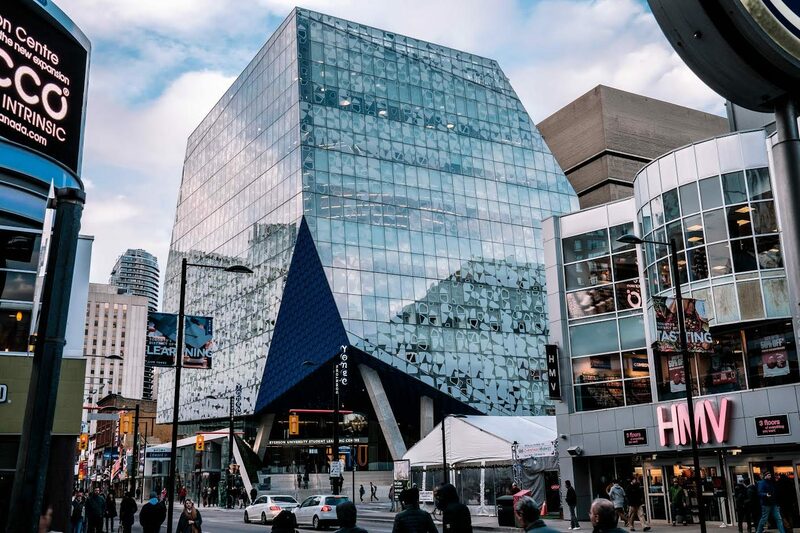 In an email, Ryerson’s registrar, Charmaine Hack, said that the school has dealt with unparalleled growth over the past two decades, and the school needs to consider how to accommodate future programs or initiatives in terms of spacing. 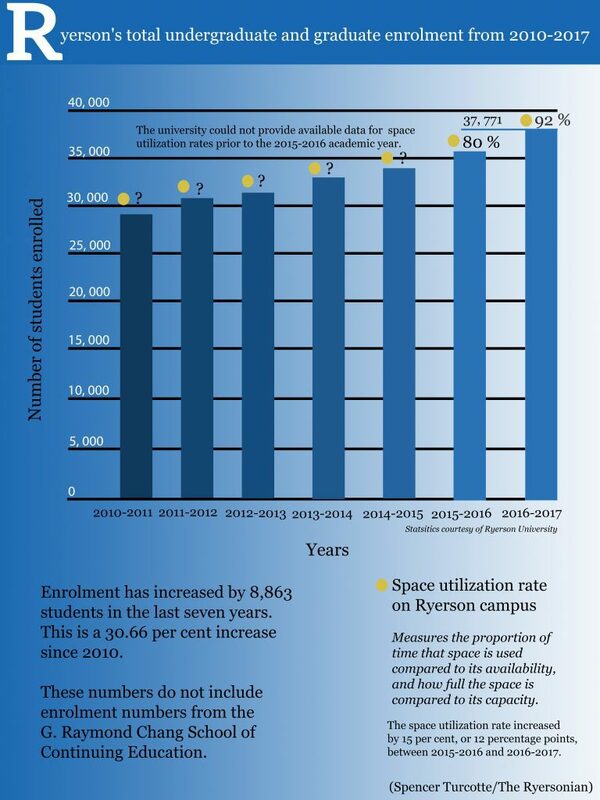 But Hack also said that Ryerson’s current space challenges can’t just be chalked down to enrolment numbers. Ryerson’s Faculty of Communication and Design (FCAD) director of operations Dan Greenwood applauded the school’s growth, but admitted that adapting to the rapid change isn’t easy. “One of the issues I can speak to, with the university as a whole, is we experience space issues as far as [having] enough classrooms. 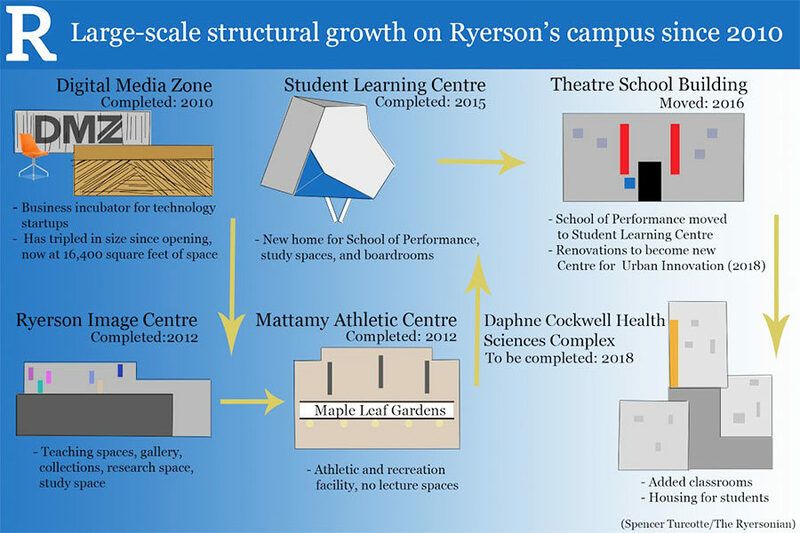 It’s not a secret Ryerson has grown a lot, which is great, but there are some growing pain issues,” Greenwood said. This semester, Ryerson’s school of journalism (RSJ) administration warned assistant journalism professor Lisa Taylor that she was scheduled to teach a first-year course in a classroom that wasn’t going to be big enough. The RSJ told Taylor they were working with the university to solve the problem, but by the first class, the issue had not been resolved. 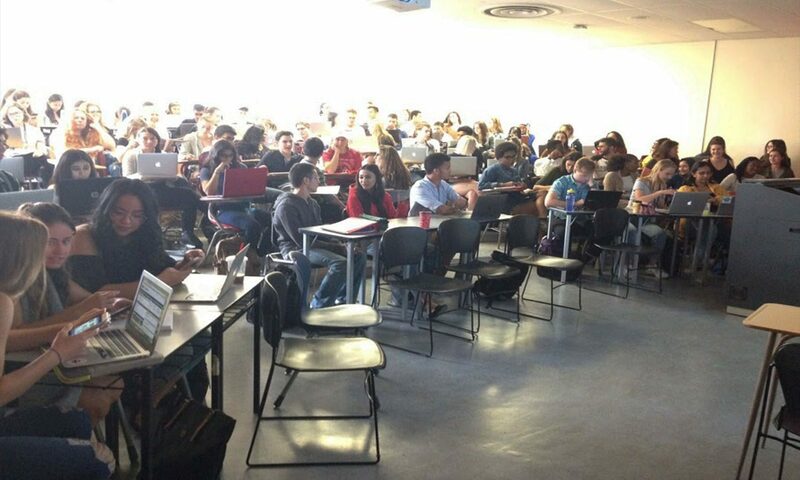 Taylor was stuck with 140 students occupying a Kerr Hall South classroom made for only 130. “It seemed like the campus scheduling people seemed to think that it was totally OK to say ‘well if people show up late then they might not have a seat,” she said. Taylor urged her first-year students to push for change, telling them that their classroom environment was not a reasonable use of their tuition. This tactic appeared to work because, like magic, she said, the scheduling department happened to come up with a solution after the dean of FCAD received a complaint from one of the first-year students. Taylor’s room was swapped with a bigger class in the Ted Rogers School of Management. When Lachemi was asked about a lack of space in classrooms during his interview with the Ryersonian, he didn’t seem to be aware of the issue. “That is something that is kind of surprising to me,” he said. 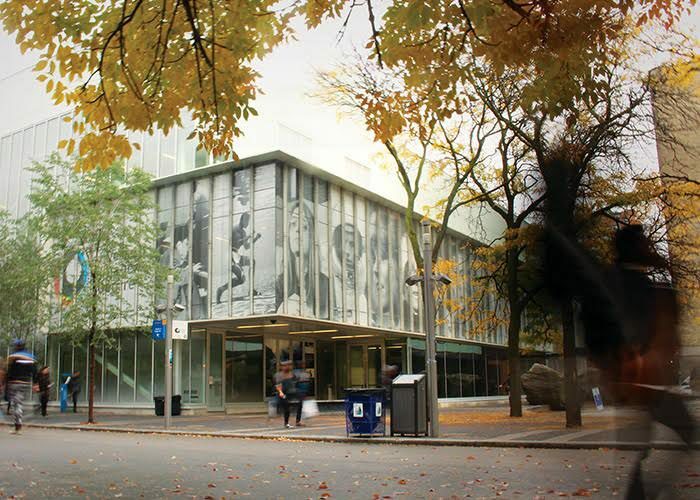 Overcapacity isn’t the only problem stemming from Ryerson’s spacing issues. As Hack mentioned, there’s also less room for other key extracurricular university components like events, guest lecturers, collaborative spaces and even meetings. Kathleen Kellett, interim associate dean of Ryerson’s Faculty of Arts, said there’s considerable competition for space, which leads to difficulty in organizing meetings. Kamal Al-Solaylee, an associate professor at the RSJ, had troubles with an event he scheduled for late November, which will be featuring a Nobel Peace Prize winner. 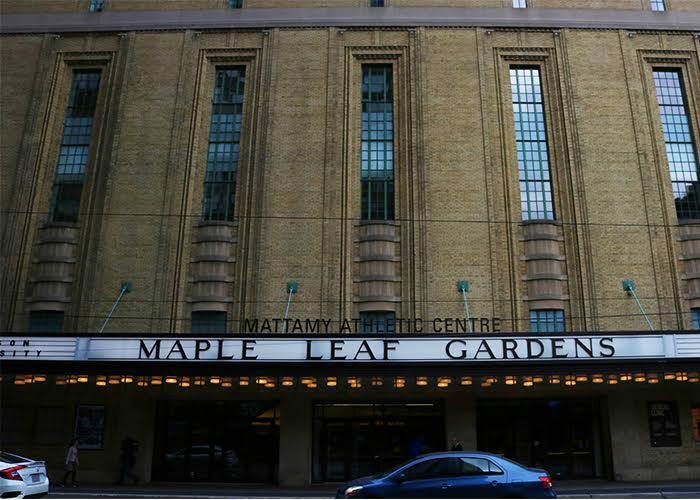 Several weeks before the fall semester, Al-Solaylee got confirmation for the event from Ryerson. The event was set to take place in the large and accommodating Eaton lecture hall in RCC 204. But then, midway through September, Al-Solaylee was told he could no longer host his event there. Fixing these spacing issues is no small task for Ryerson. 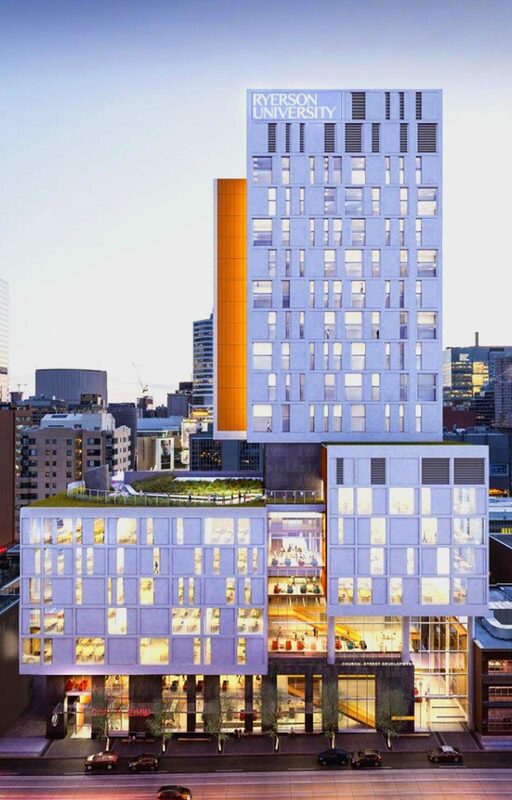 According to Yew-Thong Leong, an architectural science associate professor and the managing director at SSG Architecture Inc., Ryerson faces different challenges than other universities might, due to its downtown location. “At Ryerson we have to not just come up with the money to build, but we also have come up with the money to buy a piece of land,” Leong said. And with Ryerson’s ever-booming enrolment, Leong said the process of finding space becomes even more difficult. That being said, Leong did say that Ryerson is trying their best, and there are a number of buildings in progress that should help solve some of these issues. The Centre for Urban Innovation and the Daphne Cockwell Health Sciences Complex—which will include eight floors of academic, classroom and program spaces—are two ongoing, large-scale projects that could relieve some of the spacing pressures on campus. The pair of buildings, set to open in 2018, will bring new research spaces, laboratories, student housing and lecture halls to Ryerson. There are also several renovations in progress on campus, including in Kerr Hall, the Image Arts Centre and the RCC. As Leong said, the new projects will solve some of the issues—but he never said it would solve them all. According to Leong, university campuses often try to stay away from putting classrooms in multi-storey buildings because students change classes so frequently. In attempt to keep that in mind, he said Ryerson’s ability to build large classrooms with maximized capacity becomes diminished. “With the health sciences centre, realistically we are not adding a lot of large classroom spaces because we can only use the basement and ground level where people can walk up and down. So this becomes another issue the university has to face,” he said. But now, the issue is being pushed to the forefront. Lachemi said space on campus is something him and his colleagues discuss on a daily basis and ensures it’s something they’re working to get more of. How and when this will happen? It’s difficult to say. Faculty, staff, administration and students appear optimistic that Ryerson’s spacing issues can be resolved. But nobody seems to have an answer that’ll solve the problem permanently. For the time being, the solution may be to sit back and wait. That is, if there is a seat.